Today I’d like to show you how to quickly turn a bunch of color images into black and white. And not just once, but any time you like simply by dragging your images into a folder. Here’s how it works. We’ll start by first creating two folders on the desktop. We’ll call the first Convert to B&W and the second, Converted. Launch Automator and in the template chooser, select Folder Action and click Choose. In the workflow area that appears, drag the Convert to B&W folder to the pop-up menu that appears at the top of the window—the one that reads Folder Action Receives Files and Folder Added To. Now go to the Files and Folder library and drag Get Folder Contents into the workflow area. 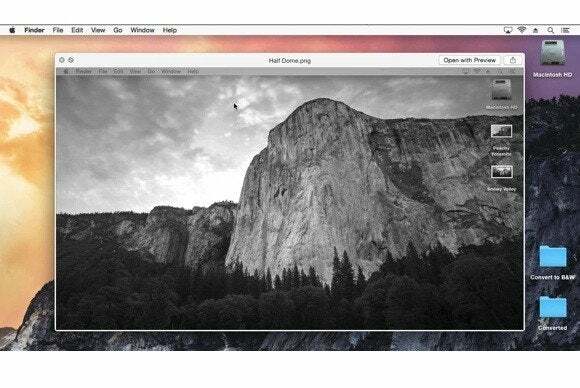 Now choose the Photos library and drag in Apply Quartz Composition Filers to Image Files. You’ll be prompted to add a folder to copy your converted images to. Choose to add it and an action will be inserted between the two you’ve created. Into this action drag your Converted folder. In the Apply Quartz action, choose Black and White from the pop-up menu. Now save your workflow and name it. And that’s it. Let’s give it a try. I’ll drag a couple of images into my Convert to B&W folder and watch what happens. Copies are created in the Converted folder and, sure enough, they’re in black and white. This provides you with a folder you can use at any time to convert your images. By way of bonus, if gives you an idea how folder actions work in Automator.